This simple and warming baked recipe is much more than the sum of its parts. 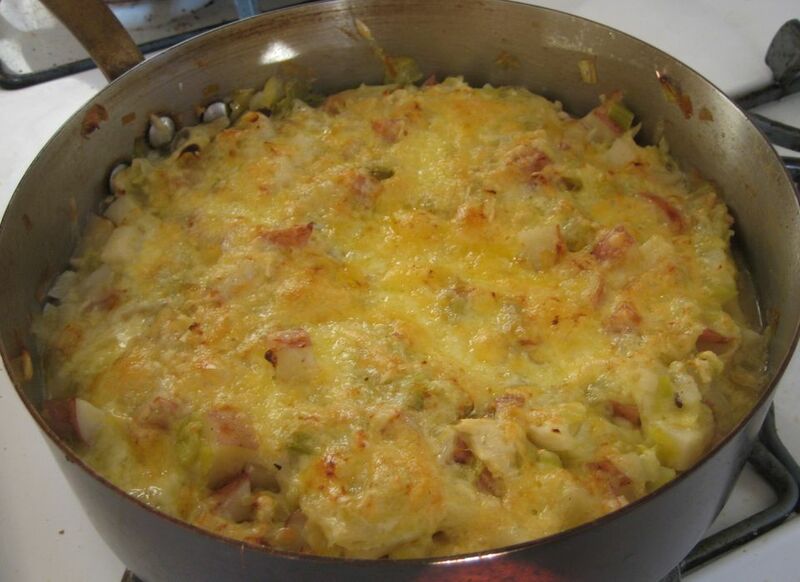 Simple ingredients combine to make a deeply satisfying dish; the potatoes and cabbage cook along with a bit of cream and then are topped with cheese to make a rich and creamy side dish. Plus, if you use an oven-safe pan from the start it becomes a one-pan meal. Use the optional bacon or pancetta for extra flavor, substitute in sausage for a heartier dish, or leave out the meat for a delicious vegetarian dinner. Preheat an oven to 375 F. Chop the bacon, pancetta, or sausage, if using. Melt the butter in a large oven-proof frying pan or stove-proof baking dish over medium heat. Add the pancetta, bacon, or sausage, if using, and cook, stirring occasionally until the meat is cooked through and browned. Meanwhile, remove and discard the first layer or two of cabbage leaves. Cut the cabbage in half lengthwise, remove and discard the core, and roughly chop the leaves into bite-size pieces. Alternatively, you can shred it or cut it into ribbons, which will create a greater variety of texture within the final casserole. Add the cabbage to the pan and cook, stirring occasionally, until the leaves are wilted, about 5 minutes. Meanwhile, peel and chop the potatoes into small bite-size pieces. Add them to the pan and stir to combine. Remove the pan from the heat. In a small bowl, whisk together the cream, mustard, salt, and pepper. Add the mixture to the pan and stir to combine with the potatoes and cabbage. Cover the pan and bake until the potatoes are just tender, from 15 to 30 minutes. Uncover, sprinkle with the cheese, and cook until bubbling and browned, 10 to 15 more minutes. You can use the heavy cream called for in this recipe, or lighten it up with half-and-half. If you're trying to cut the fat even more, go with chicken broth or vegetable broth. If you like the flavor of wine in savory dishes, a dry white wine would work just as well as the broth and add a kick of acid that works nicely with the cheese. If this recipe went over well at the dinner table, you might also like butter braised cabbage, potato leek gratin, or braised cabbage and onions.